When shopping around for Google Ads PPC services – you may be confused by the numerous different pricing models that you encounter. It is important to be educated on what cost structures many paid advertising agencies are utilizing so that you – as a business owner looking to advertise on Google – know what you can expect to be paying. Why are there so many different pricing models you ask? Well, each pricing model differs from agency to agency based on a few factors. 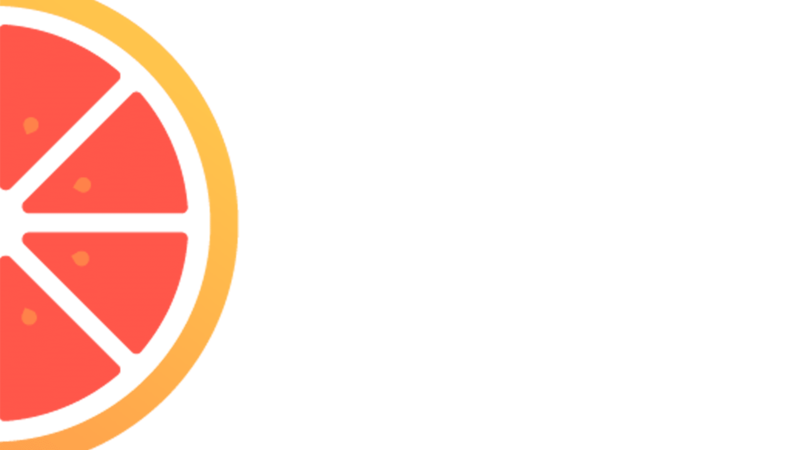 Some being – the goal of the advertising campaign, ad budget available, expertise, management costs, and time available to manage the campaigns. By understanding what your goals are you’re able to better align yourself with the agencies that offer the correct model of PPC pricing. In this article, we’ll be exploring popular pricing strategies and which model suits you the best based on your advertising goals and other typical variables that you should consider. By the end, you should have a clear understanding of what pricing model will get you the most return on your ad spend so both you and the agency will benefit from a healthy flow of business. The purchase funnel is a fancy word for explaining a buyer’s journey to find your business or product. The potential buyers at the top of the funnel are people just looking to find out more information or increase their awareness. This can revolve around a specific brand or it can be on the general topic. As you approach the bottom of the purchase funnel, people here are ready to buy because they have progressed through the awareness stage at the top and have made a decision. This decision can be based on preference due to research or brand loyalty. As you can imagine, a PPC campaign that is designed for a well-known established brand with a loyal following will differ from a startup that no one knows about. 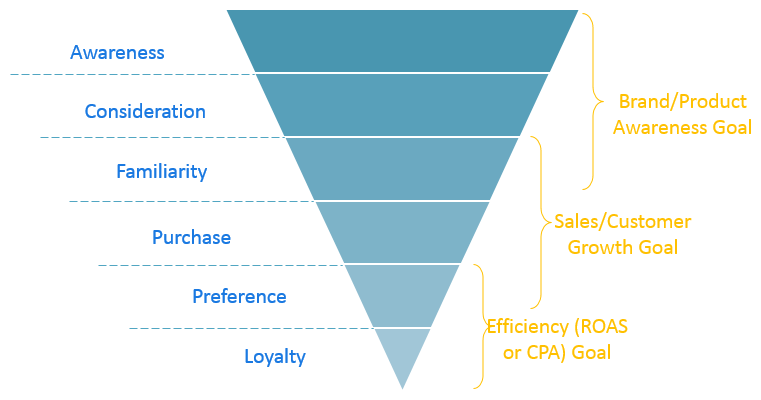 You need to define where you are on the purchase funnel and create marketing goals around it. By reviewing your current traffic sources and which traffic is converting into sales – you are able to determine where your paid advertising campaigns should focus on. For example, if you’ve built up your website using SEO and it is gaining huge amounts of organic traffic daily which in turn builds up your authority but this traffic isn’t converting – you may want to focus on paid campaigns that are aimed to convert more bottom of the funnel visitors. Similarly, if the majority of your traffic is coming from paid advertising and you have no organic traffic – you need to continue your PPC efforts in that regard. By identifying your traffic source and what part of the funnel you want to using PPC advertising for – you can have a better idea what pricing models will work for you. Based on your goals and traffic sources – there are different pricing models that you should consider. We will cover the most popular ones that you will encounter in your quest to find the perfect agency. Keep in mind that some agencies may use a combination of these models. There are freelancers and agencies that prefer charging by the hour because it is easier to calculate based on their hourly rate. It is the simplest and most well known pricing structure. Because there are no contracts (usually) and you can monitor their work on a daily / weekly basis – if the provider isn’t performing as expected you can pivot quickly. Additionally, the agency will be reminded to give you the attention your campaign deserves. This model is good for businesses who are already running campaigns that are set up correctly but need daily / weekly optimization to make sure that things are running smoothly. Pro tip: attention doesn’t equate interest! What this means is that on an hourly rate basis – agencies are not incentivised to increase your performance. They may simply just maintain the current performance (if profitable) or get it to a mediocre level rather than optimizing the campaign for maximum performance. This model is the most popular in the PPC universe. The management fees that agencies take are based on a percentage of the total ad spend for the campaign. This makes sense because the higher the budget – the more work that it takes to maintain optimal performance for the campaign (i.e. there are more things to track and manage). Typical percentages range from 10-20% of ad spend (some agencies going as high as 25%) This model works for most goals and budgets because it is so linear which makes it extremely easy to track in terms of profitability. We suggest this model for businesses that are starting fresh campaigns with no prior data. Typically, for a new campaign, there will be a one-time setup fee included to get the campaign rolling. The start of a campaign always takes the most work because of the assessment into the proper strategy. Pro tip: Be careful of agencies who use this model and constantly push for an increase in budget. That is, obviously, how they increase their fees so keep an eye on their reporting and key metrics that you should base your decisions around. Remember that you need to clearly define some KPIs around campaigns – whether that is ROI, ROAS, Impression Share, etc. If the agency doesn’t set these goals with you before starting a campaign – there will be no direction for the overall marketing efforts. The flat fee design charges a flat management fee regardless of the ad spend budget. This is typically ideal for businesses who have large ad budgets that want professional management for their campaigns. In comparison to the percentage of ad spend model – this fee structure safeguards your investment to a certain extent because the management fee to the agency is fixed. Whether you need to increase or decrease your spend – the agency’s interest is separate and thus facilitates honest recommendations and discussions between the business and the agency. There is usually also a contract put in place so that the workload and performance may be reviewed after a certain period. Because of this contract term, and the option for renewal – agencies will usually strive for the best performance possible. Pro tip: This pricing structure is for a company that wants an overall campaign that targets multiple levels of the funnel. This type of structure allows for constant tweaking and optimizing based on a predetermined ad budget so you are able to maximize your returns. This may not be suitable for smaller projects that just need maintenance or periodic tweaks. The tiered flat fee pricing is an offshoot of the flat free pricing model and this just adds breakpoints to certain ad spend budgets. For example, this may be a $1,000 management fee for an ad spend up to $10,000. 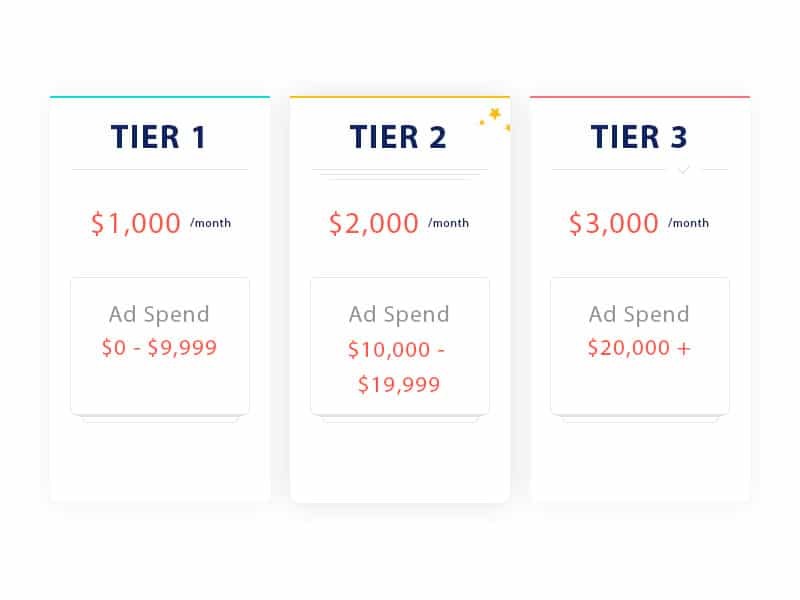 This tiered structure allows for the benefits of a flat fee structure but in tiered increments so that it scales as the campaign scales. The tiered flat fee structure is ideal for businesses that want to form a relationship with an agency to achieve long term goals on all parts of the funnel. However, they might not have the funds to meet a regular flat fee agency’s ad spend requirements for the marketing campaign to make sense. Pro tip: Like a flat fee structure this pricing model also works with contracts. If you have a set marketing budget and commit to a tier – the spend can be burned through quickly. Allocate wisely and make sure you are defining KPIs and overall goals with your PPC agency. This kind of model is solely aimed at bottom of the funnel conversions. This should not be used at all for the top of the funnel awareness campaigns. Performance-based pricing is when the agency takes a fee for every lead or sale that the ad generates. This is a model that facilitates results and can be extremely effective at capturing conversions. Some agencies might take a commission on every lead or sale that they generate – although this is more of a lead aggregation model, just be aware that it exists. So now that we’ve covered the most popular pricing models for Google Ads you need to determine which model will work for you. Start by determining your business goals and then fielding agencies for what kind of pricing they work with. Make sure that you’re looking for a Google Ads Agency that is willing to understand your goals and work with you to make it a reality.